A tale of a horse conscripted into war, and the young man who attempts to find him. Utilizing puppetry, scenic elements, music and movement, the epic comes to life in a breathtakingly original production. 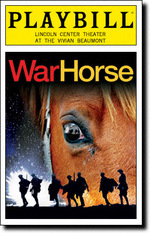 The drama recounts the adventures of a horse as he moves from life on a farm into the battles of World War 1. It's also the story of a friendship put through the toughest tests. Through the eyes of the war horse, Joey, Michael Morpurgo tells this moving and powerful story of survival on the Western Front. War Horse is a story about a boy whose father gets a horse when he is young. The boy and the horse grow up together. When the horse is sold to the army, the boy decides to enlist so he can be near his horse. I haven't seen the movie, but the show on broadway was fairly enjoyable. It lasted almost three hours (including one intermission) and it felt a bit slow at times, but the story was reasonably engaging. War Horse is a beautiful play - both the music and the puppetry were a beauty to watch. The story was a bit slow and I would have been happier if the show was an hour shorter, but it was still fairly entertaining. While the story isn't the best, the amazing puppetry makes up for it.